Uma Thurman and her daughter look nearly identical — see the pics! It's a mother-daughter double take at Paris Haute Couture Fashion Week. 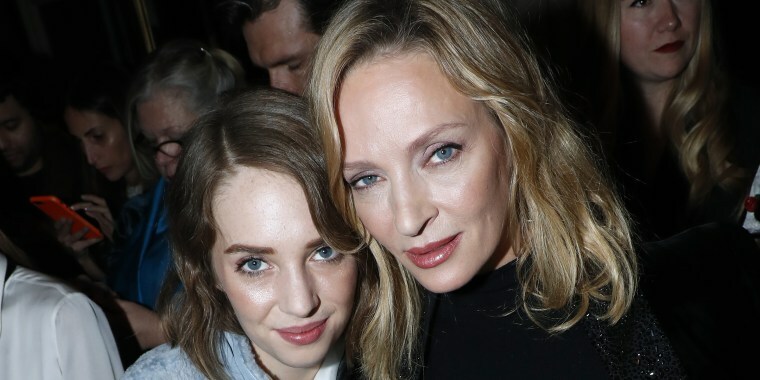 It was "like mother, like daughter" when actress Uma Thurman and her daughter Maya Thurman-Hawke, hit the town for the Giorgio Armani Prive Haute Couture Spring/Summer 2019 show. The show is part of Paris Fashion Week, which is running from Jan. 21-24. While the stylish duo are not exactly "twins," they do bear an uncanny resemblance to one another, especially when they pose with their best runway looks! Maya paired her pale blue pants with a long pale blue coat and a white shirt with a black bowtie, while her mom donned a black multi-tiered skirt and a black metallic blazer. Thurman posted a pic from the Paris event on her Instagram, saying "Thank you Mr. Armani for a wonderful show. You are truly spectacular." The mother-daughter duo were photographed sitting with singer Celine Dion and actress Amber Heard. Like her mother, Maya is embarking on her own acting career. Last year, she was cast in the third season of the Netflix hit series "Stranger Things." She plays Robin, characterized as an "alternative girl" in a tweet from Netflix. Maya has also starred in BBC's "Little Women," playing the role of Jo March. In a tweet after the debut of "Little Women," Thurman gushed over her daughter, saying, "You were the first wonder of my life, and may the world open up to you, and the angels keep you safe." We think Maya looks even more like her mom in these photos shot for designer Zac Posen's spring 2019 collection. The pair join a host of other mother-daughter look-a-likes, including Heather Locklear and daughter Ava Sambora, Cindy Crawford and daughter Kaia Gerber, and Kris Jenner and daughter Kim Kardashian. It must be nice to have superstar genes!